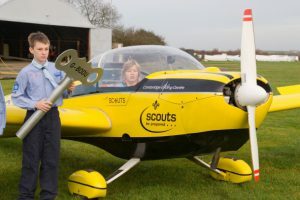 The Cambridge Gliding Centre, in conjunction with Hertfordshire Scouts, operates a Falke motorglider, previously belonging to the Faulkes Flying Foundation, to offer air experience flights to Scouts. On Saturday 2 December 2006 there was a short handover / unveiling ceremony to mark the beginning of the activity. 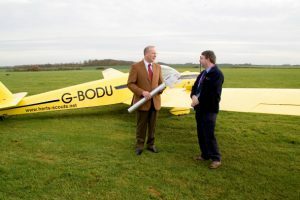 These pictures were taken on that day and show Neil Broughton, Air Activities Adviser – Hertfordshire Scouts(right) receiving the key to the motorglider from Mike Woollard representing Faulkes Flying Foundation. 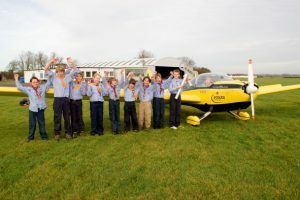 Also shown are some of the scouts who will be participating in the activity in the future.